Sometimes it feels like you really have to fight for dreams. I’m actually not a huge dreamer. By that, I mean, I don’t have a million different dreams. I do have one big dream though. And that is to have a self-sustaining horse-powered farm. I’m not 100% sure why but deep down I’ve known for the past decade that it’s what I want to do. I’m also naturally a pretty positive person. I do have a tendency to look at what always needs to be done, but I do it from a positive view. Obstacles don’t usually bother me. I just figure out a way to move past them. But even for me, sometimes keeping my hope firmly planted in knowing that one day this dream will come true is difficult. The past 10 years have been a fight for this dream, and it feels like I still have a bit more fighting to do. About the time I started this journey, I got married and had kids. Having kids definitely slows things down a bit. There’s not as much spare money or time. About 2-years-ago, I sent my thoroughbred horse to retire at my parent’s house in Tennessee, and I bought a Norwegian Fjord, which is basically a small draft horse. She was 25-years-old, and an old-timer at farming and pulling. I bought her so she could teach me. It was a huge step towards my dream. It was hard to let go of my thoroughbred (and friend) I’d had for 12 years, but I knew I needed to move forward. This past summer I got to go to Montana to a “farming with draft horses” workshop that was a week long with one of the best horsemen in the world for this kind of thing. It was a dream come true. I came back saying it was in the top 3 weeks of my entire life. I rarely have been so happy, so fulfilled and knowing I was doing what I was meant to do. But every day still feels like a fight. I question what I’m doing. My husband has been so supportive, but there are days I feel bad for the money we put towards this. I do amazing at keeping horse expenses low, but where we are in life right now, every penny counts. I wonder how can I keep pursuing this dream when it probably won’t make us money. Yes, it’s a lifestyle I want to pursue and live with my family, but sometimes I get caught up in budgets and saving, and I worry my dream is taking too much of our finances with no return. That’s not true, though. The return is that I’m pursuing a life that makes me fulfilled. But sometimes I still believe the lie that there is no return and lots of money being invested. I guess I’m writing this, because sometimes we know so strongly that something is right, but it’s not always easy. Sometimes I get tired of pushing through. Sometimes I just want it to be smooth and easy. But I also know that so much of the dream is the process to get there. But truth is, I don’t want to go backward. 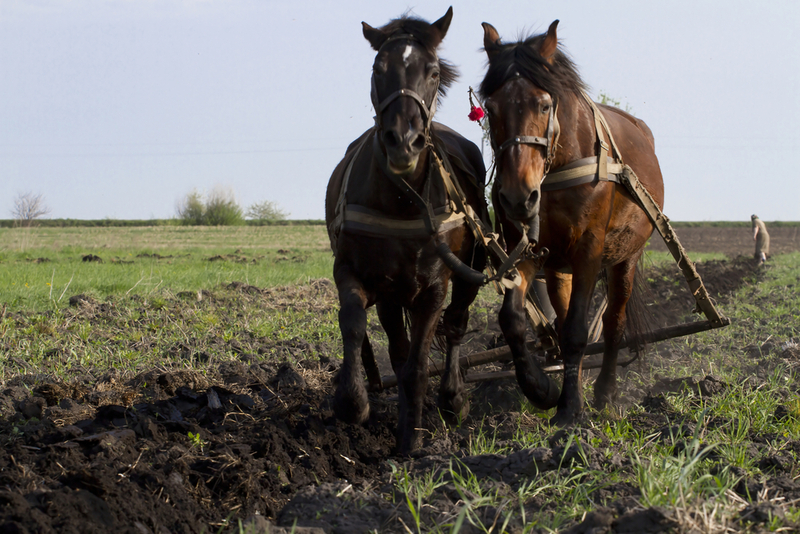 It might look like it on the surface… farming with draft horses rather than tractors, but what it really is, is moving forward. Moving forward into a pace of life that I desire. Moving forward into a lifestyle that gives back rather than takes from the earth. Moving forward partnering with creation and supporting my family through a self-sustaining farm that leaves the world a better place rather than taking from it.